If you are a fan of Tarantino-esque type films then this is one you...it is an entertaining movie that requires viewing more than once to catch all the little nuances and details. It's been a while since we've been treated to a highly stylized film in the vain of film noir. During the 1990's we saw quite a bit of that genre but we seemed to have lost sight of it with all the action/superhero films of this millennia. Bad Times At the El Royale reminds us of why we loved these types of movies and what a beautifully directed piece can bring to the big screen. With incredible sets, costumes and an award-winning cast, it offers some of the best of what filmmaking should be. With its release on 4K, it allows us to enjoy the movie all over again in the comfort of our own homes. In the early 1906's the El Royale was a premier hotel that attracted lots of celebrities and famous people. Sitting on the border of California and Nevada, it offered its guests a unique experience. By 1969 though it lost its luster and sheen and was all but abandoned. So when four unique individuals show up on the same day during the "off-season" you have to wonder what is going on. As each saunters into the once grand lobby of the hotel you are intrigued as to what is about to come. Laramie (Jon Hamm; Mad Men) claims to be a vacuum salesman who visits the hotel on several occasions. Father Flynn (Jeff Bridges; The Big Lebowski)is passing through town as is singer Darlene Sweet (Cynthia Erivo; Widows) on her way to a gig in Reno. Emily (Dakota Johnson; Fifty Shades of Grey) enters like a bat out of hell and offers no explanation as to why she is there. Throughout the night a series of strange events occur revealing everyone's true nature and the reason for being there with most of the guests (and the lone staff member) – spoiler alert – ending up dead. Hamm plays much the same type of character he did on Mad Men… a wheeler and dealer businessman, only he has a secret where we see an entirely different side to him. Bridges is brilliant as always playing the criminal pretending to be a priest. Erivo is a stand out in this terrific cast not only vocally but in her portrayal of the world-weary Darlene. Johnson has a swagger that tells everyone who sees her not to mess with her. Lewis Pullman (Battle of the Sexes) is the staff member who has secrets of his own while wearing a certain naivete and Chris Hemsworth (Thor: Ragnarok) makes everyone devote themselves to him through his teachings and motives are less than altruistic. Together this ensemble cast brilliantly navigates writer/Director Drew Goddard's (Cabin In the Woods) script masterfully. The 4K disc has exceptional quality and you can't help but drool over every little detail in the hotel. The costumes and sets truly stand out in this 2160p resolution version. More impressive is the Dolby Atmos audio. Since the music is a character in and of itself in this film, sharpness and clarity are vitally important and the audio quality showcases it beautifully. The surround sound has you hearing noise from all angles and is a treat. The only extra is housed on the Blu-ray disc in the combo pack and is a 28 minute " Making of" which covers everything from casting to set and costume design to the collaboration amongst the cast and crew. While the films starts off strong, the third act loses a little of the built up steam when Hemsworth enters the hotel. His presences takes the film in a different direction and doesn't seem to fit with the stories that have been built up to that point. There are also a few McGuffins that move the plot along but never get resolved, leaving me with more questions than answers. If you are the type of person who likes this particular genre of filmmaking or you are a fan of Tarantino-esque type films then this is one you will want to add to your collection as it is an entertaining movie that requires viewing more than once to catch all the little nuances and details. 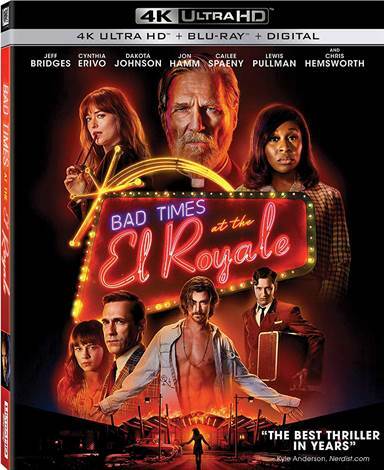 Download Bad Times at the El Royale from the iTunes Store in Digial HD. For more information about Bad Times at the El Royale visit the FlickDirect Movie Database.